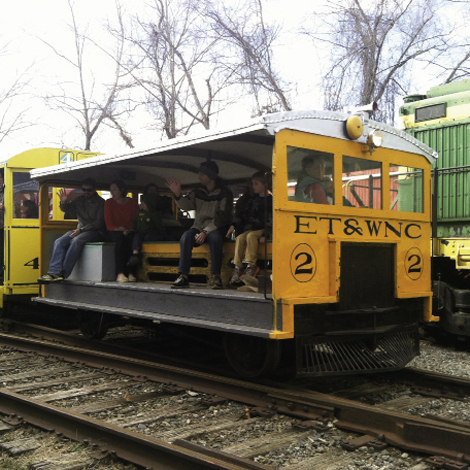 More than a century ago, people could travel between Asheville and Weaverville by hopping a trolley that connected the two towns. Now, you can retrace a 3.5-mile stretch through woods and river flats on the Craggy Mountain Line, a nostalgic railroad venture. The two-hour excursion includes a layover by the French Broad River, where you can picnic or stroll by the water. Founder Rocky Hollifield, a former engineer for Great Smoky Mountains Railroad, has been working to restore the spur since 1996. He and his crew run regular trips every other Saturday from April through October, and you can also book birthday parties and special events on any day but Sunday. And come December, the line will run the Christmas-themed Jingle Bell Trolley. Hollifield and a team of volunteers have a long-term vision for the line, with plans to build a depot/museum at the site of the old Leicester stop. Once completed, the station will guide visitors through a history of local railroading and several restored cars, which Hollifield has been collecting for years. You can see them on the tracks now when you book a tour.